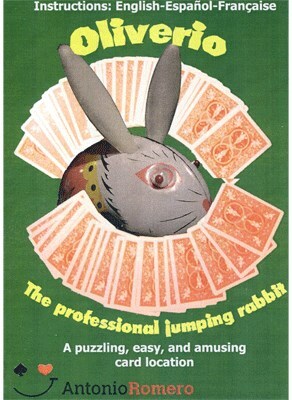 After spreading the deck on the table and showing all its cards, you introduce Oliverio, The Professional Jumping Rabbit who, thanks to his powers, is able to locate any card. To prove it, you have a card selected and returned to the deck. To make it more challenging for Oliverio, you cut and shuffle the cards. Then you spread the cards in a circle. A spectator winds up Oliverio and sets him in the center of the circle. The rabbit begins to jump around amongst the cards, eventually stopping at one of them. You set that card aside and swipe the rest of the cards away. The spectator names his card, which proves to be the one Oliverio stopped at. Oliverio did it again.